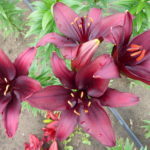 Planting Lilies are best planted in bulb form in the early fall before the ground becomes cold. This allows the bulbs to start root growth before winter. While the bulbs can still be planting in the spring, the resulting plants will be just a little bit less robust. They can also be planted as potted plants and planted in the summer, much like other familiar perennials. This is how they are found in the garden centers. For a larger choice and for fall planting, bulbs are often mail ordered from reputable suppliers. 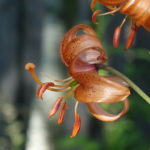 Care must be taken to ensure the planting location and conditions lead to healthy and successful lilies. Good drainage is a must, so avoid areas where water collects – a raised bed or slope would be a good choice. Amending the soil with compost or organic matter will assist with drainage as well as providing the loose, rich soil that lilies prefer. Planting depth will vary depending on the size of the bulb. A good rule of thumb is to dig deep enough that the soil above the top of the bulb is approximately 2 times the size of the bulb. This results in bulbs being planted between 3 and 8 inches deep. Err on the side of planting too deep, rather than too shallow. Bulbs should be watered in after planting, and adding a layer of mulch can help with moisture conservation and weed suppression. Lilies are relatively undemanding plants, as long as their basic needs are provided. They are resilient to heat and cold, and do not generally need staking. They require full sun or dappled shade – some varieties can handle more shade than others. As mentioned above, open soil with lots of hummus and good drainage is essential! 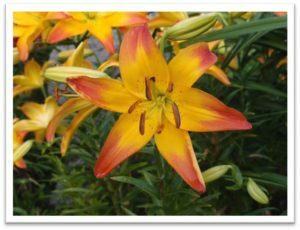 Lilies grow most vigorously in the spring and summer and their moisture needs are at their highest at these times and in general terms its best to keep lilies consistently moist. Once lilies are well established they can handle periods of drought, but if you are concerned about losing valuable specimens it will not hurt to give them a deep drink of water. There are varying opinions, but if lilies are grown in good, rich soil they should not need additional fertilizers. with locating the bulbs in the spring before they emerge. There’s so much more to learn about lilies. We hope to offer more on topics such as lily species and cultivars; divisions and their descriptions; propagation; diseases and pests; uses and partners in the garden.